Lava Xolo Q800 the first Quad Core device by Lava. We showed you How to root your Xolo Q800 yersterday and there’s a Clockworkmod waiting to be flashed on your device. There are two ways through which you can flash the recovery. First method is long and bit hard for some people who are doing it first time. Well but the second method is much easier and anyone can flash CWM recovery through it without any issues. So what are you waiting for get started with anyone method below. 2. Extract Xolo Q800-CWM- Recovery.zip. 6. Now go to window option in SP flash tool and check (tick) write memory. 7. Now you’ll get a write memory option in this window check “EMMC” in memory setting and open raw data and load recovery.img again. 8. Change recovery Partition Begin address :_ 0x2d80000 container length 0x600000 now click write memory now tool will search for device. 9. Connect your phone via USB cable. Finally now you have successfully flashed the CWM Recovery on your XOLO Q800. If you find that method tedious than try our method. You can install CWM recovery on your Xolo Q800 without PC. Its much easier method and you don’t have to follow a long guide. 1. Download the recovery and rename it to recovery.img and transfer it to external SD card. 2. Start the MobileUncle tools. app. 4. This will flash CWM (Clockworkmod) recovery. Now there you have it..!! 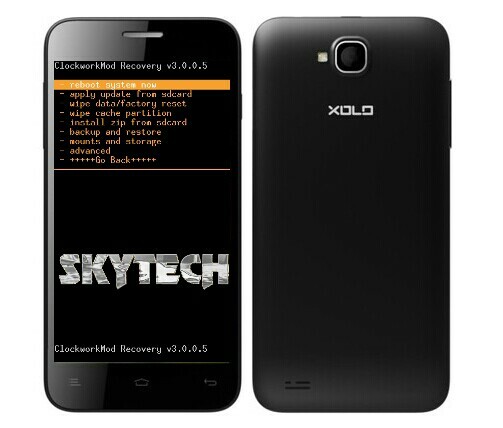 A CWM recovery flashed for your Lava Xolo Q800 without PC.